Nice blog, it's good to see someone taking an interest in Ge'ez, you're right it is a very under-studied Semitic language. As ሐ = ح, etymologically, and I thought phonetically too. Is this not the case? I don't know much about Ge'ez phonology, but all books I've read on the issue seem to suggest it is. Wa 'aleykum as-salaam Abu Rashid -- You are correct! 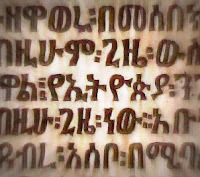 The closest phonetic approximation of the pharyngeal < ح > in Ge'ez is < ሐ >. I spelled my name with a < ሀ > simply because that's how its pronounced in Urdu, my native tongue i.e. that's how it's pronounced in my head (in fact, the last name محمود is typically pronounced /mɛmuːd/ - without an "h" sound entirely.) Thank you for your note though. I suppose I ought to transliterate my name here according to its Semitic pronunciation -- in the spirit of linguistic revival! Handling dead languages such as Ge'ez is very demanding. I am not a linguist but since I came from the highlands of Ethiopia, I know the script. So after Amharic became supplanted with English due to passage of time in USA, I decided to go back, in time ,and learn Ge'ez. That was when I was in Los Angeles. A few months later I had to move to a remote place where no one speaks Amharic, let alone Ge'ez. So I got stuck with Lambdin, Leslau and Dillman books without any support system. Today I googled for Ge'ez groups and found this and the semiticroots website with its beautiful transliterator. Keep up the good work. This is very motivational.